The first year of Eleventh Doctor stories comes to a stunning conclusion as secrets and lies come tumbling out of the TARDIS, and enemies old and new conspire against the Doctor and his friends! Witness all of SERVEYOUinc's origins and plans revealed, along with the fates of the Doctor, Alice, Jones and ARC! 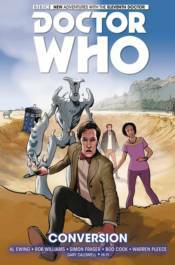 Collects Doctor Who: The Eleventh Doctor #11-15 and the eleventh Doctor short from the FCBD 2015 special.